Create algorithms for Earth Data Observation processing and analysis, use many scripting languages, present results on the map, use web mapping services. Do it for many users in fully scalable cloud-based environment. Jupyteo is a high performance, cloud-based Integrated Development Environment based on Jupyter Notebook. Jupyteo is highly integrated with Docker isolation approach in services propagation. It is an environment for Earth Observation data processing: data scripting, algorithms building, solutions validation and dynamic testing of developing part of a processing code. Jupyteo as an “all-in-one” software integrates most common EO-based, GEO and GIS tools, software, libraries and toolboxes for EO data (SNAP, OTB), vector and raster data processing (GrassGIS, GDAL, PostGIS, etc. ), visualisation and presentation in the most suitable form. Based on Jupyter approach and extended Python environment integrated with Docker prerogative it allows for interconnection with most of existing services (WPS, WMS, TEP interfaces) and tools for geodata storage and distribution (PostGIS, Geoserver, Mapnik, etc.). 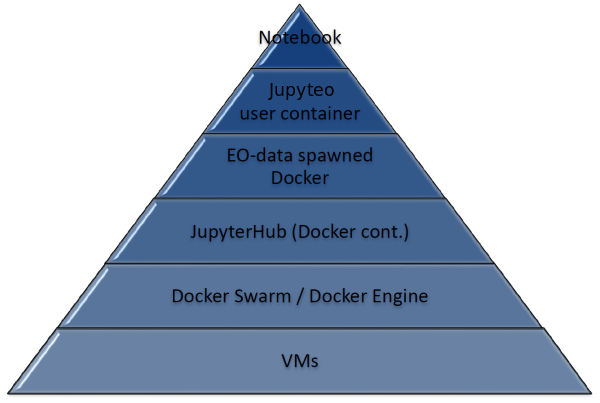 Jupyteo based on configuration, customization, adaptation and extension of Jupyter, Docker Swarm components provides highly configured and optimised software for any EO cloud infrastructure. It allows to make development and EO data processing tasks with high performance in place without data transfer. On infrastructure (cloud) side Jupyteo is built on top of Docker environment. It integrates Docker, Docker Compose, Docker Engine, Docker Machine, Docker Swarm composed in separated Jupyteo Docker Stacks. Every user works with own virtual machine. The cluster management and orchestration features embedded in the Docker Engine are built into Jupyteo IDE environment. 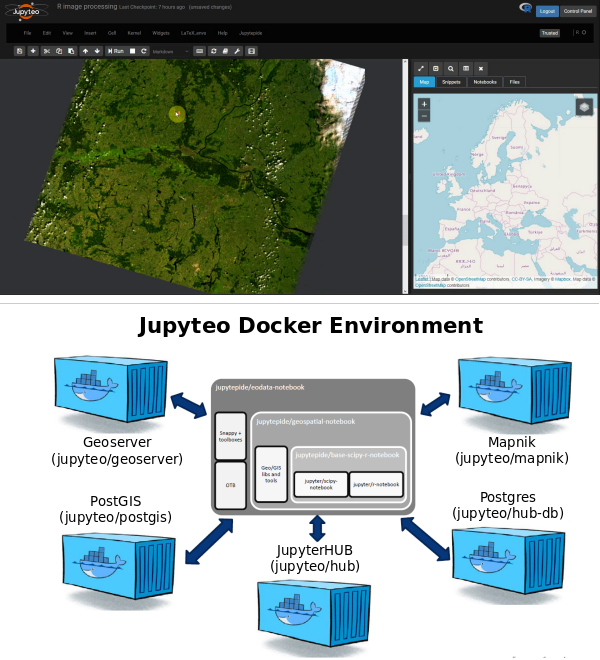 Based on Docker infrastructure Jupyteo IDE allows for high performance EO data processing with environment isolation for a large scale of users and services. 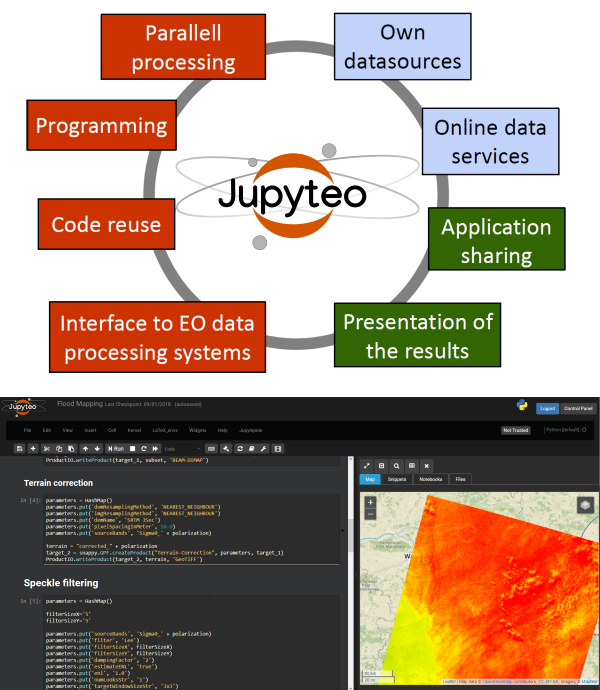 Use Jupyteo for Earth Observation data processing! It allows for significant leveraging of the available EO developer tools (readers, mappers, libraries) to perform EO data specific tasks. It extends an ability to integrate the notebooks in existing solutions/platforms, providing an added value to the existing environment. it serves as a web-based solution to multiple users, or - going further - to different groups of users (each as a “tenant”) with a proper isolation and mutualisation of cloud resources. It provides an ability to process a growing amount of EO data by an expanding community of developers and scientists. It allows for making use of a large amount of resources to perform more work in the same time or the same work in a shorter period. The full adaptation and reuse of most popular tools and components is the main paradigm in Jupyteo IDE development. 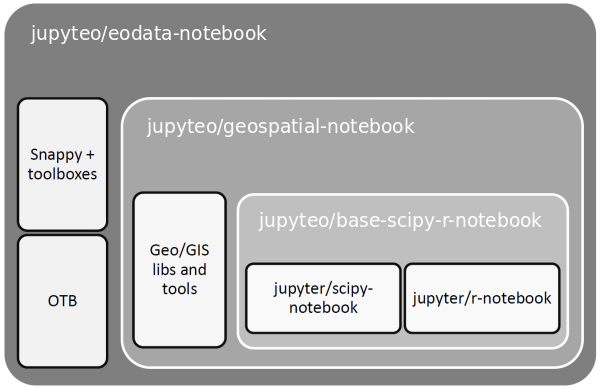 Jupyteo and Jupyter notebooks as an implemented set of reusable EO data toolbox components aim for integration in the EO cloud platforms in Europe and beyond. where user can test them and made his EO-based Jupyter notebooks.